We are successfully meeting the varied needs of our patrons by offering a wide gamut of PP Display Book as per their precise needs. Filewell Stationery & Manufacturing Co.
- Designed to display & store, designs, broachers, certificates & most valuable documents. - Pockets made of ANTI STATIC polypropylene. - Sheets in each pocket allow double side filing. - Clear pp pocket allows to photocopy document without taking out them. 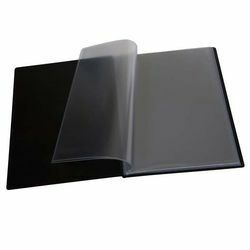 It's a Polypropylene file with see through display pockets to keep catalogues, pricelists, certificates etc. It helps to view all the contents without taking it out. Available in A/4 + fulscape 10, 20, 30, 40, 50, 60, 80 & 100 pockets. Note: Each pocket can display two documents, back-to-back.